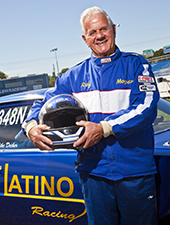 On September 27, 2008, at the age of 69, race car driver Roy Latino successfully eliminated eight other cars to win the Wally Parks trophy, the official award of the National Hot Rod Association. Known as “The Wally,” this trophy is the world’s most coveted – and elusive – drag racing award. Demonstrating the value of experience, persistence and dedication to his craft, Roy achieved this racer’s dream after decades of pursuit. Many people are surprised to learn that racing today is less about pure speed than mastery over machine – drivers predicting how their vehicles will perform and then making that happen. Victory can’t be purchased through a bigger engine or faster tires. Winning a race is now more mental than mechanical. It requires knowledge, focus and awareness – of your vehicle, of climate and track conditions, and of the drivers who are lined up against you. In a world that increasingly demands instant gratification and immediate rewards, Roy reminds us that true success is only achieved through determination, discipline and hard work. On any given day you’ll find Roy preparing for his next race at No Problem Raceway in Belle Rose – testing, fine tuning and testing again. While inexperienced drivers frequently obsess over engines and speed, Roy makes sure to also notice subtle things like humidity and the demeanor of his competition. Decades of experience have refined Roy’s ability to detect the small details that often make a big difference. Life offers us valuable lessons as we age, and those who pay attention will grow from these experiences. Through more than five decades of racing, Roy, now 74, never stopped learning or setting new goals. And that’s why he’s still the man to beat. Roy Latino … Peoples Health Champion.